The Force Traveller-Monobus is the monocoque panel bus in this category and is offered in both 33 seater and 41 seater options, in both standard and school bus variants. Force Motors has launched its all-new 33/41 seater Traveller-Monobus in India, at the ongoing 2018 Bus World Exhibition. It's the first-of-its-kind monocoque panel bus in this category and Force claims that this new Traveller-Monobus offers new and first-in-class features in the midi-bus (33 - 41 seats) segment. Designed and developed by Force R&D team, the Monobus is entirely made of pressed steel panels welded in an automated and robotic environment and is claimed to offer superior structural strength and durability. The Traveller-Monobus will be offered in both 33 seater and 41 seater options, in both standard and school bus variants. 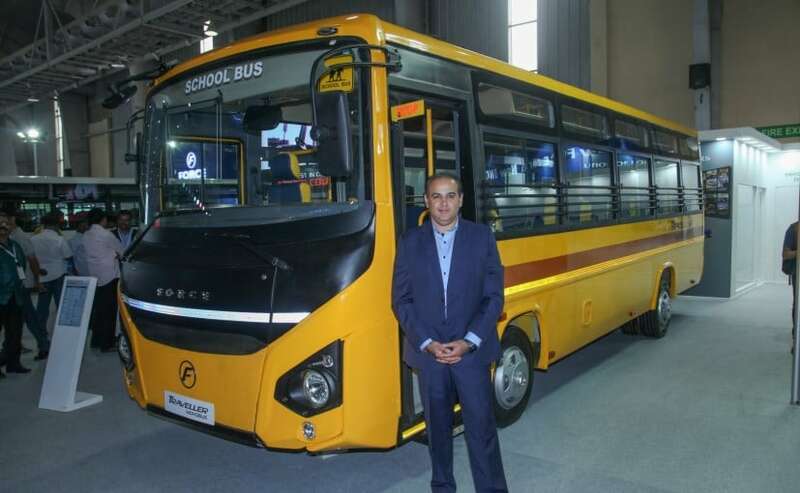 Talking of the new Traveller-Monobus, Prasan Firodia, Managing Director, Force Motors said, "The Traveller-Monobus is a fully in-house effort of our R&D team and I am confident it will set new benchmarks in performance, comfort, reliability, durability and safety. These same qualities have enabled Traveller to become acknowledged leaders in the 9-26 seater minibus category. The monocoque construction is possible due to extensive use of large pressed panels - which are fully designed, tooled and produced in-house. Force Motors has applied for a number of patents on this product and process technology"
The Mono bus has been designed to offer easy entry and exit, thanks to its low floor height, and is claimed to come with the lowest centre of gravity aiding in superb ride stability. The bus is also claimed to offer low NVH levels, the smallest turning radius and seating comfort, thanks to its 2.35m wide body interiors, which offers a wide gangway, full standing height and ample legroom for occupants. The Force Traveller-Monobus is powered by a Mercedes-sourced 3.2-litre, common rail engine that churns out 115 bhp and develops 350 Nm of peak torque. The automaker claims that the bus offers best-in-class power to weight ratio, while peak torque of 350Nm is offered from 1600 to 2200 rpm. The Monobus is almost 800 kg lighter than comparable models and comes with disk brakes on all wheels with new uni-booster hydraulic braking technology, ABS, EBD and latest Engine Drag Torque Control ensuring top class, sure stop braking.